Sliding Barn Doors are a great way to add a rustic touch to your home and no matter your style, we can help you design a piece that is not only one of a kind but also a perfect fit in your home. Each door is custom sized, priced and made to your specifications and we make sure to go through each detail with you. We construct our barn doors from both reclaimed and classic plank materials and can finish, or unfinished, to your specifications as well. Check out our sliding barn door gallery or come by our showroom to see the many options available. Clicking Here will bring you to the Contact Us page for directions as well as other contact methods for getting a custom quote. To get you a personalized quote you’ll need to know what type of material you’d like the door to be made from (See our selection of Barn Siding for reclaimed options, and our Classic Pine Selection for new wood) along with the dimensions, and design. We offer a selection of House Designs but can custom make your door to your specifications. 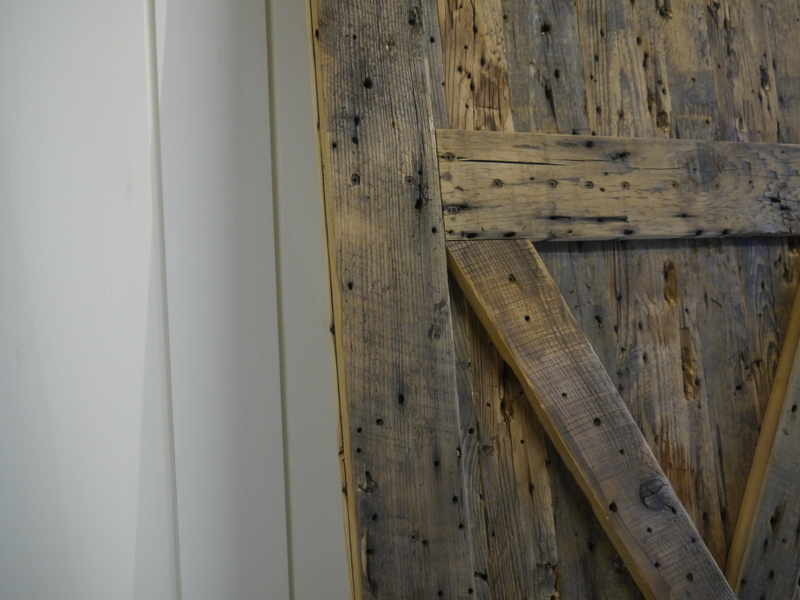 This Reclaimed Sliding Barn Door is made from a great load of roofboards. The Chestnut has such great grain and the reclaimed coloring of the roofboards are just beautiful. By mixing species this reclaimed sliding barn door blends the unique grain pattern and coloring of both the brown barnboard and the reclaimed roofboard materials. This Overlay Style Barn Door is constructed using reclaimed roofboards which gives it extra character. This trio of reclaimed sliding barn doors show the range of color variation in the barnboard material. This sliding barn door is made of reclaimed roofboard material for a rustic appearance.